We offer classical EUR pallets of 1,200mm x 800mm, new and used ones, atypical pallets according to the wish of the customer or according to our design based on the required carrying capacity of the pallets or other requirements. 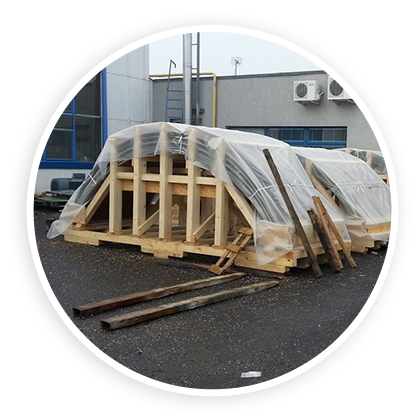 All the pallets provided by us are heat treated and comply with standard ISPM15 (IPPC) for the treatment of wood suitable for international transportation. Please contact us if you have exact requirements. We offer all-wood boxes or OSB3 boxes to protect your goods during the transportation either by a truck, by air or for overseas transportation. Our boxes meet international standards. The boxes are certainly made of heat treated wood according to standard ISPM15 (IPPC) and upon customer request we can also issue an international certificate on treatment of the wood used. We offer pallet racks of standard dimensions 1,200mm x 800mm, as well as non-standard dimensions according to customer requirements. Our pallet racks are made of dried, planed and heat treated wood according to standard ISPM15 (IPPC) and therefore they are suitable for international transportation. With the pallet racks, we also offer pallets and lids, and/or internal partition. We offer corrugated packages according to FEFCO standard or according to our (your) design including different types of internal cardboard fixations and trays. From the material aspect, we offer a wide selection of choices starting from microfibre up to a seven-layer cardboard, from the lowest quality to water resistant cardboard. We offer different types of foams from the material and shape aspect according to specific customer requirements. We use classical and antistatic foams with density from 25 kg/m3 up to 100 kg/m3. From the shape point of view, we can adjust to customer requirements and we can also offer our own design. Cardboard plastic packages are offered in different versions such as boxes, internal grids or trays. We offer a wide range of thickness, weight and colour of cardboard plastic. We offer ALU foil in the width of 1m, 1.5m, 2m and in a three-layer or four-layer version. Certainly with the ALU foil we can also offer desiccants in the required amount and size of the packaging. As another alternative of anticorrosion protection, we can offer VpCI foil in the version of classical foil or stretch foil. We also provided different dimensions. See the document - Principles of how a VpCI foil works. Both methods of anticorrosion protection meet the standards for overseas goods packaging and we also have long years of personal positive experience with them. Our company has long years of experience in packing different machines and equipment into boxes, on pallets or with fixation in a container. We can design and implement packaging from the smallest packages up to oversize cargoes up to the weight of 50 tons. We provide full service including the design of box, calculation of anchorage and lifting points and manipulation techniques. Our trained professionals perform the packaging at your premises in a fast and safe way. We offer flat, half-sleeve, sleeve foils, classical, zip and 3D bags in different thickness and in different colour versions, imprinted, different thickness, shrink, antistatic, anticorrosion, bubble ones - all that according to the requirements of the customer. Our offer also includes heat shrink foils up to thickness. Based on a 3D model and requirements of the customer, we will design thermo-shaped trays of different thickness, materials and sizes. Supplementary goods. We offer tie bands, stretch foils, tapes (also with print), impact and tilt indicators, and free fillings.